Based on the novel by award winning writer, Dean Koontz, comes the wildly successful Odd Thomas. This story was so popular, that it's become an entire series, one that Koontz has worked on almost exclusively since it's release. This unique story focuses on a unique man, with a unique name. Odd (Anton Yelchin) is a short order cook in a small California town, where he lives a relatively normal life with his girlfriend, Stormy. Odd is no different than any other twenty-something in town, except for the fact that he sees the dead, specifically people who died prematurely and under suspicious circumstances. They can't talk to him, but the spirits lead Odd to the evidence he needs to find the truth. When a strange man comes to town, the spirits lead Odd to be suspicious, and with good cause. Anton Yelchin stars and once again shows off his loveable charisma. There is something about him that makes Yelchin the guy that everyone wants to be friends with, an ability that comes across in every character he plays. Odd is no different, as he is this complete weirdo, but with an innocent quality, that just makes people want to like him. Here he's more than just a lovable goofball, but he's also an unofficial detective and hero, that people turn to in there time of need. Everyone knows he's weird, but few know his secret, one of those being the Chief of Police, played by the legendary Willem Dafoe. Dafoe usually portrays the bad guy, and it was interesting to see him take on a different challenge. 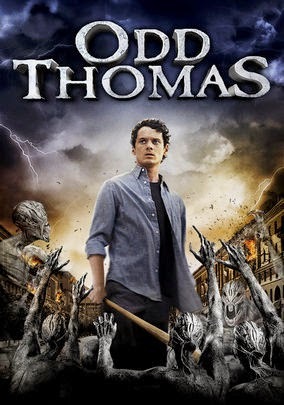 Odd Thomas is smart and extremely well written, with a terrific cast, that really brings the story alive with their own unique style. The story may seem like it's a little out there, but it's not just science fiction, it's a story that crosses many genres and has something for everyone, an easy choice for our list of must see movies! NOTE: As per the requests from our loyal followers, I will now be including a banner that will inform readers of which movies are currently streaming on Netflix!